If you have built or are planning to rollout high speed internet access networks with a different financial model (or their variants) to the 5 described here, please tell us here. 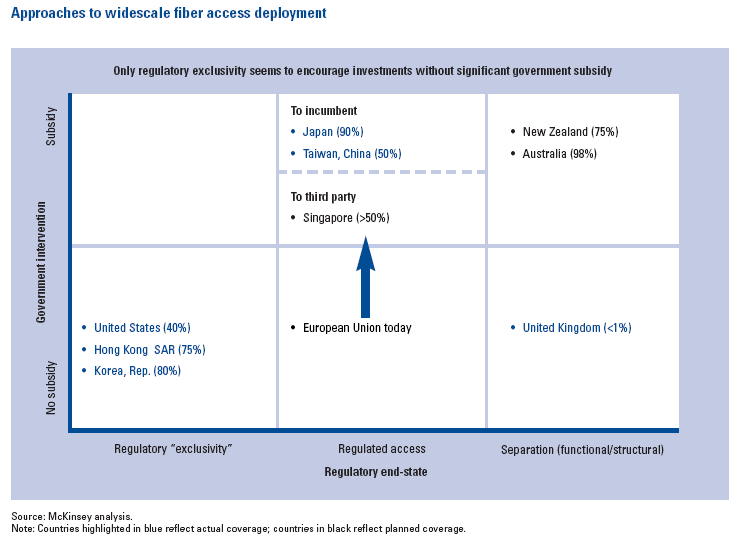 “Fixed-line operators can recover falling revenues and improve their operating costs by deploying fibre networks. But the investments that such networks require are so large that regulatory support of some kind is essential to guarantee that they are able to make a positive business case. Regulators need to manage carefully any shift in their regulatory focus from competition to investment incentives, in order to get the balance right. But they must also avoid continuing regulatory uncertainty, which is delaying the investment in fibre networks that all sides of the industry want. Incumbent fixed operators are mindful of their duty to work with other stakeholders in the industry—government, policymakers, and competitors—to achieve national aspirations. Singapore with a high urban population of five million concentrated in high rise buildings is said to be using a “franchise” model – a three tiered pyramid. At the base, a network company (OpenNet) owns the fibre; in the middle, an operating company (Nucleus Connect) activates it and sells wholesale capacity to the retail service providers at the top of the pyramid, who sell services to residential and business customers. It has been suggested that for most European cities the passive equipment, fibre and duct could be combined (OpenNet and Nucleus Connect) into one contract or company owned and operated by a PPP entity which could be anything from fully private to fully public. In addition we favour at least a golden share or 51% by the public sector as this entity could be controlled by a service provider and thus distort competition. Do you agree? Is this a model you and your region favours and why? Q. Are there any other models for public authorities which have been used but which are not been included in the Blog? If so which ones? (please give your short description of additional models and/or URL of projects using these models). A. One additional model is a model similar to the model of financing highways in France. The passive infrastructure deployment shall be at the initiative of the public sector, outsourced to the private sector in a PPP model (launched at a regional level). The private sector will build, operate and maintain one single, open and neutral infrastructure, on which the telcos will provide innovation and end users differentiated services thanks to their active products. The wholesale access to the passive infrastructure will be provided at a regulated price, that will be the same whatever the location of the passive fiber network. Q Which do you think are the pros and cons of the models described (or the additional model you proposed) bearing in mind the need for public funds to further social, economic and territorial cohesion goals of less advanced regions and rural areas? A. The main con of models proposed it the level of public funds required to deploy the infrastructure. The model proposed above allows cross subsidization between a single regulated wholesale access price and the cost of network deployment that may vary between the regions. Q. In your view, which of the models above sustains the highest level of competition, openness, transparency, or best value for money and are able to provide a high speed infrastructure at an affordable cost and to an adequate quality able to support social and economic development in your area? A. Both types of competition, competition between passive infrastructure and competition between services, shall not coexist since one will restrain the other. The PPP model proposed is based on separation of passive and active infrastructure. This model ensures a high level of competition at the services layer, with the most added value to the end user. Investments shall be secured in one single open passive network, while telcos differentiate themselves on the level of services thanks to their active equipments. 	ensurance of high quality services to end users thanks to competition at the services layer. And moreover the best tools in order to give Europe the future proof infrastructure needed to compete with most advanced countries in TIC sector. An important step in successfully adopting the federal and european broadbandstrategies was the implementation of the so called broadband initiative of lower saxony and a boradband competence center (Breitband Kompetenz Zentrum Niedersachsen – b|z|n ) concentrating knowledge and resources in this field and assisting the pupblic sector in improving and implementing broadband networks. As an example of funding the implementation of NGA networks according to EU competition regulations and the NGA guidelines by state aids we would like to mention the region of Rotenburg (Rotenburg an der Wümme). The region Rotenburg / Landkreis Rotenburg/Wuemme with its 57 communities got a notification from the commission for its braodband measure. high speed internet provision without State aid, as no infrastructure investment took or is going to take place within the near future. The Rotenburg measure aims at the implementation of an NGA network. An NGA network is defined as a network which is able to achieve a minimum of 40 MBit/s download speed. However, for budgetary constraint reasons, the authorities introduced a threshold of 30 MBit/s download speed. This means that in areas where networks of a minimum of 30 MBit/s are available or will be available within the next three years on commercial terms, no support will be granted to upgrade them to 40 MBit/s download speeds. As a result oft he region’s notified programme the investment in NGA infrastructure will be supported. The support can cover the backhaul part of the network and the last mile. The backhaul (regional) network is to be understood as the connection from the nearest suitable access possibility to the area which should receive broadband coverage as well as the distribution within that area via main distribution frames and other distribution points, e.g access points such as street cabinets and wireless base stations . Backbone infrastructures will not be supported. The state aid will grant only the profitability gap oft he provider construckting the network after being chosen in an open tender. This profitability gap is defined as the delta between the discounted investment costs and discounted revenue oft he project. During all stages of this project there was a very close cooperation of all local stakeholders involved in it with the Breitband Kompetenz Zentrum (b|z|n). We hope to have contributed to your request. We are looking very much forward to the upcomong conference in Brussels where our general manager Mr. Peer Beyersdorff will be glad to meet you. Two models are limited. Public sector ownership, so competition with private sector entities may be disjointed. A better role for the public sector and grant sources is already in the private sector dbo. Using other models, by definition includes everything, so needs refining. The options are investment vehicles. As the next step, they need refining with socio-economic business returns over time to indicate their viability to assess options for investment vehicles in different settings. As referring to your discussion with Nima Azarmgin from SES, please find below the summary of our service solution for closing the digital gap. 24 May 2011, Brussels – During the “Satellite day” organized by the German Association of Telecommunications and Value-Added Service Providers (VATM) in the Representation of the State of North Rhine-Westphalia to the European Union, we presented SES Astra’s DSLAM solution. SES Astra’s satellite-based broadband service ASTRA2Connect, the largest European satellite-based broadband network, offers for households as well as for small and medium-sized businesses in regions without broadband connection a low-cost and immediate solution to close the white spots. The ASTRA2Connect service is independent from any terrestrial networks and is immediately available anywhere within the footprint of our satellites, with a pan-European coverage over Europe. We are able to provide broadband for households with download speeds of up to 6 Mbit/s. With our recently launched innovative solution, satellite-based broadband connection via DSLAM, we are able to serve entire communities with high-speed internet connection in rural regions. End users do not even need to install their own satellite antenna at their homes. The single satellite dish is installed at the aggregation point of the street cabinet and the broadband connection to the end customer is realized via the existing last mile infrastructure, via the telephone lines. Thus end customers only need a standard DSL modem to access the broadband internet. (one time costs for activation fee and DSL modem). Communities do not have to invest highly into the set-up of a new infrastructure while end users benefit from all the advantages of broadband internet. This service is available independently of the respective infrastructure at the aggregation point via the last mile to the end customer. This is why we are able to realize the ASTRA2Connect broadband connection via TV cable networks (coaxal) and WiFi masts (wireless) as well. We would therefore like to use the opportunity of the Digital Assembly to further promote this solution as well as our constantly evolving satellite broadband services and make sure public authorities are aware of alternative ways to connect their constituencies in a timely and cost effective way. The research institute Acreo has been commissioned by the Government’s Broadband Council to conduct a prestudy investigating the social benefits of broadband. The prestudy shall investigate the influence of fiber-based broadband on economic growth, on the national level as well as in individual municipalities. Intensive work is presently spent on the implementation of the digital agenda and deployment of new fiber-based broadband network in Sweden. Traditionally, broadband investments have been evaluated primarily from a telecom operator perspective. For the public interests, however, economic growth and impact on the public sector are crucial success factors to be taken into account. Acreo will perform a statistical analysis linking effects of fiber investments in specific socio-economic factors. The analysis is based on Acreo’s long-standing research in ICTinfrastructure, combined with studies of the ICT maturity of Swedish municipalities. The prestudy will show which factors should be considered from a societal perspective, when the results of investments in fiber-basedbroadband are evaluated. “We are delighted to be entrusted to conduct a study with such a great importance to the development of broadband and to Sweden”, says Crister Mattsson Senior Advisor at Acreo. “Acreo has many years’ experience of research in fiber optics and broadband infrastructure. To combine our research with indicators of social benefits will provide new and more comprehensive assessment criteria for future broadband investments. The study will be presented in September. Competition and market dynamics cannot be distorted by arbitrary actions of the network operator or wholesale provider as long as the regulator is monitoring effectively the market. The participation of (or a controlling share by) the public sector in this type of endeavors does not mean that conflicting incentives disappear. A regulatory oversight is profoundly important especially when investments tend to create physical or articifial infrastructure monopolies. The source of these investments (public or private) is less important. The public control or influence of a network operator’s strategy relate to meeting social needs and requirements (expanding coverage to underserved areas, subsidizing prices etc. ), but not truly to sustaining a competitive environement. Everyone likes to be a monopoly, both the public and the private sector. This is why when public investments are made (i.e. tax payers money), there are strict ex-anti regulatory provisions to secure fair and non discriminatory commercial policies.